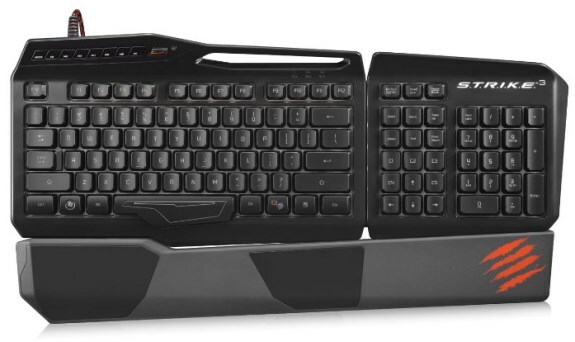 Mad Catz announces the availability of its S.T.R.I.K.E.3 gaming keyboard, it's sold for $99.99 (99.99EUR). Previously announced at E3 in June 2013, the S.T.R.I.K.E.3 is designed with the competitive gamer in mind, featuring a unique membrane key-bed designed to offer the full tactile feedback of mechanical keys but without the excessive noise or the need to 'bottom out' the keys. Darren Richardson, President and Chief Executive Officer of Mad Catz Interactive, stated, "The addition of the S.T.R.I.K.E.3 provides us with an eco-system of keyboards cementing our commitment to passionate gamers with a range that meets their budgets and exceeds their expectations." The S.T.R.I.K.E.3 features a full RGB backlit key-bed, capable of displaying up to sixteen million customizable colors. In addition to full media controls and a removable wrist-rest, the S.T.R.I.K.E.3 features a total of twelve macro keys and three separate modes of operation, providing a total of thirty-six programmable buttons. The S.T.R.I.K.E.3 is available in gloss black, gloss white and gloss red colors.